Walter Bruce in 1973 when he landed the largest tuna that year – 1017 pounds, written on the tuna with shaving cream! 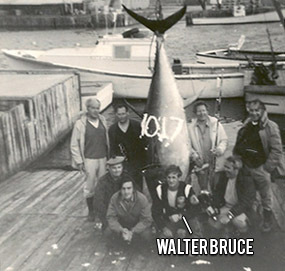 The North Lake Tuna fishery as told by Scott’s father, Walter Bruce a fisherman for 54 years and counting and a pioneer of the PEI tuna charter fishery. “The first tuna landed in North Lake Harbour in 1967. At that time bluefin tuna were called horse mackerel by the locals and were thought to be a nuisance fish as there was no market for them and they tore holes in the fishermen’s nets. Word of the bluefin tuna showing up off North Lake Harbour spread to the international sport fishing community. Soon after, a vibrant tuna charter fishery began with local boats taking out charters from places like Germany, South Africa and Australia. North Lake soon became known as one of the few places you could land a fish weighing over 1000 pounds and was coined the “Tuna Capital of the World” because so many records were broken here. This was significant because to belong to some of the more prestigious sport fishing clubs one had to land a fish weighing over a 1000 pounds. This was just the beginning of tuna fishing in Canada. In 1973, I landed the largest tuna of the year at 1017 pounds. Back then when we first landed tuna, we paid someone $10 to bury the fish after the trophy pictures were taken. Initially, there just wasn’t a market for them and the locals preferred the taste of other fish. However, a local fish buyer began freezing the fish and then sent them to Japan. He paid us $10 for the tuna, which to us was like $20 because it previously cost us $10 to bury it. We soon found out that in his first year of selling the tuna to Japan, he made a $1,000,000.00 off our fish with no rebate back to us. We never sold him any more tuna. The charter fishery grew and remained strong until the mid-eighties when the results of intense seining of tuna off the Carolinas was felt. With diminishing stocks in our area my son Scott and I traveled to other locations to go tuna fishing in Canada commercially and to charter fish. We participated in the Canada Tuna Cup out of Canso, Nova Scotia and the International Tuna Cup out of Halifax, Nova Scotia. And commercially fished out of Shelburne, Nova Scotia in an area called the Hell Hole which is 90 miles offshore where we’d spend several days at sea. People who “hook up” for the first time always saw they never expected the fish to show so much power. It’s an exhilarating and intense thrill that’s actually hard to describe in words. It’s something you just have to experience. Even when tuna stocks were low in our area we never stopped fishing in Canada and traveled to areas where the stocks were strong. Aside from helping to pay the bills, catching a tuna is a huge thrill every time. Each time is a different experience because every fish is different. It might take 10 minutes to land the tuna or it’s taken us upwards of ten and a half hours. People who “hook up” for the first time always say they never expected the fish to show that much power. It’s an exhilarating and intense thrill that’s actually hard to describe in words. It’s something you just have to experience. Within the last 10 years the tuna have been coming back to the waters off North Lake. The fish we see are all from different year classes, which bodes well for both the commercial and sport fisheries. Walter Bruce has served as the Canadian representative of the International Commission for the Conservation of Atlantic Tunas (ICCAT).